Ah~ You can tell Wiglaf and Azrael are buddies. Though I do need to figure out when Azrael became Wiglaf’s arch rival instead of Arthur. Probably the same time I decided Arthur was a nice guy considering his occupation. 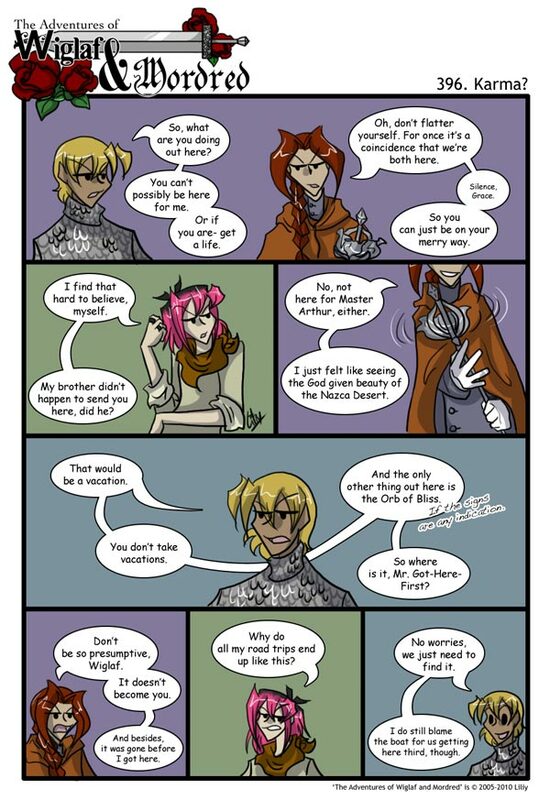 XD Wiglaf and Azrael’s quarrels often seem very moderate in tone for two arch-enemies. So it makes sense that they would have been buddies at one time or another. MORDRED IS WEARING A COLOR OTHER THAN BLACK AND ORANGE. WHAT IS THIS LIE? Is it just me or does Mordred look paler when he wears light colors? Probably just me. Also, love the little “Silence, Grace.” and Az twirling Grace. And these three in general. Well, appart from Azreal being a @#$%, I’m pretty sure that Wiglaf over reacted, and TOTALLY go for the tranz-formers *snicker*.